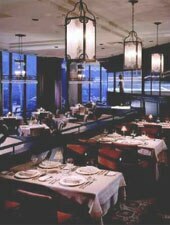 Chef Anthony C. Bombaci offers sophisticated dining at this Dallas landmark high atop the Hilton Anatole. : From Nana's perch atop the Hilton Anatole, chef Anthony C. Bombaci offers guests a menu of contemporary cuisine beginning with appetizers such as the grilled Texas quail with butternut squash caponata. Entrées include seared Scottish salmon with garbanzo bean and pork ragoût and a mesquite grilled Prime filet of beef with oven-roasted red onions. The seasonal menu changes frequently, so the best approach is to go for the tasting menu with wine pairings. For dessert, try the lemon tiramisu or the warm Valrhona Manjari chocolate “coulant.” Nana looks as handsome as its food, and the service is professional. The extensive wine list is presided over by a keen staff, and the scenic view of downtown Dallas is even more dynamic by night than by day.